The Silver Heron Gallery is the design and vision of Talley Winthrop-Woodmark, aptly named after a treasured piece of Swarovski crystal that was given to Talley by her husband John. "My gallery is a reflection of many diverse and creative energies, constantly changing and interacting with one another." Constructed in 1926 By H.L. 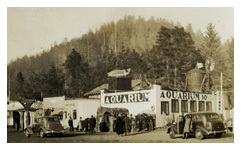 Collins, the Silver Heron building was originally an interactive aquarium, built as a tourist attraction to sell real estate in the 1920s. 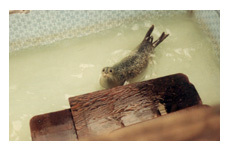 John Woodmark purchased the property in 1978, and continued to operate the business formerly known as the Depoe Bay Aquarium until 1998. 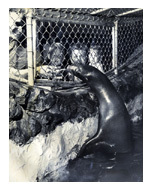 Then the Woodmark family made the decision to close the aquarium and relocate their three remaining Sea Lions to the San Diego Sea World. 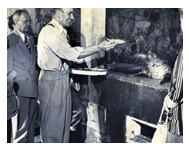 After 72 years of entertaining people of all ages, the oldest privately owned aquarium in the U.S. closed its doors for the last time. John Woodmark lovingly gifted the building to his wife Talley, and the real work and vision began. This historic Depoe Bay landmark built of old fisherman’s tales and home to the many rescued seals, harbor seals, and sea lions had been built to last. Almost 5 years of extensive remodeling began with jack-hammering out the building’s dark fossil-rock façade, and then laser cutting through the six feet of concrete and rebar that made up the existing main seal tank. The building was artfully sculpted into the magnificent new Silver Heron Gallery, which opened its doors to the public in the fall of 2006. Talley respected all that her historic building had to offer. "My foremost concern was to make the best possible use of the space without changing the original foot-print, and in doing so, I feel that I enhanced the fundamental soul of the building." says Talley. Talley wanted to focus on the natural and tranquil surroundings of her coastal environment, "When someone enters the gallery, they are already in an emotionally relaxed frame of mind. They have either been for a walk on the beach, had a nice meal down the street, or are enjoying a romantic weekend. Varied tones of blue and silver, the predominant accent colors, were chosen for the gallery, to echo the changing hues of the ocean." The transformation of the space makes a lasting impression on all those who come in contact with it. With its soaring 22-foot ceiling, and artistically curved staircase, the cool, elegant atmosphere of the gallery is sure to appeal to anyone with an appreciation of art, music, fine foods, and wine. As you ascend the staircase you become more aware of the sophisticated, contemporary openness of the mezzanine floor, where you'll find The Artist's Palate piano bar and wine salon. One of the essential elements in the design was the placement of the baby grand player piano; you can almost feel the waves of beautiful music washing over you. Next you enter the artfully decorated wine tasting bar where you can view artwork showcased by national and international artists in an ascetically pleasing environment. You may choose to partake in a glass of the Silver Heron’s private label wine or take a stroll through the balcony door, which is often opened to the salt-laced air. From this picturesque observation deck, you can witness stunning vistas of the harbor, mountains, and ocean, hopefully catching a glimpse of Depoe Bay’s resident grey Whales. Welcome to the Silver Heron Gallery, where art harmonizes with nature in one of the nation’s most spectacular settings.